Not the most attractive looking product! This weed killer sprayer makes It easy for you to reach the weeds you’re targeting without having to come into direct contact with harmful chemicals. This sprayer gives you a better coverage of the weeds in your garden and makes it much easier to get to harder-to-reach areas without having to climb across your plants. At the same time, it offers the precision you need to avoid spraying chemicals in places that you don’t want them to go. To look at this is not an especially attractive product. But then it’s not in a product category that you generally expect to be attractive. This is a simple grey, plastic canister with a nozzle for directing the spray attached to a handle and cord (or ‘wand’). The main unit fits comfortable on your back, so you can do your best Ghostbusters impression. Power is good here too, offering up to 150PSI! This is ideal for covering large areas, making this a good choice for people with large gardens and grounds. What’s important with a product like this is that it has all the necessary safety features in place. In this case, everything is present and correct and you can rest assured that you won’t be dripping weed killer across your lawn, border plants, or anywhere else that you don't want it to go. One way that the product offers greater safety is through the use of high quality poly seals with in-built chemical resistance. The pump is also easy to access, meaning that you don’t need to fumble around while balancing the chemicals. 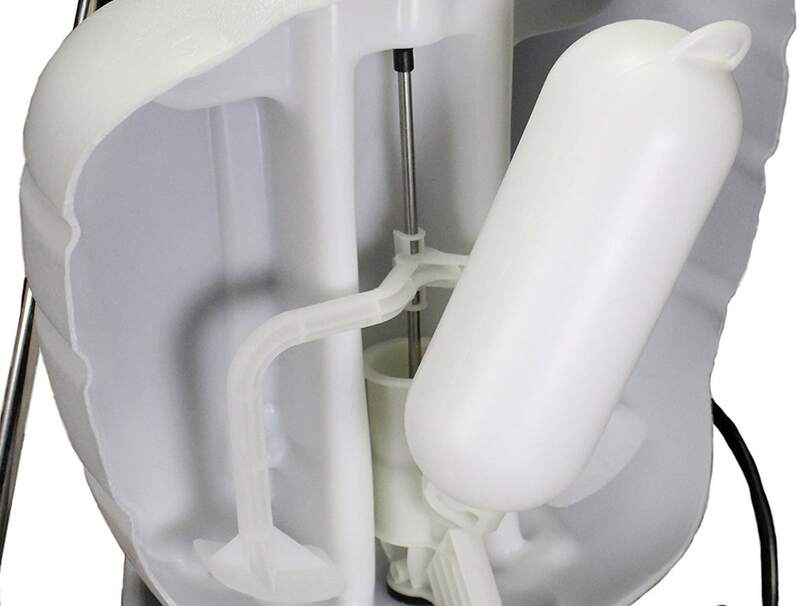 The pump uses a ‘no leak’ design, although you rather hope that this is going to be the case with any product of its kind! Another useful feature is the inclusion of four different nozzles for a range of different applications. These include two flat fans, a foaming nozzle, and a brass adjustable nozzle. The tool will also accept TeeJet nozzles if you want to add extra functionality to your purchase. The wand can be easily stored by attaching to the top of the canister. There’s actually a long list of design features that have been implemented to ensure a safe and easy experience. At the time of writing, this product is enjoying stellar reviews on Amazon and has an average rating of 4.5 stars out of 5. This is based on 110 reviews, most of which praise the ease of use, the safety, reliability, and power. One user describes being able to spray trees that are up to 20 foot high! I managed to cover an area of 0.78 acres in one day. As I am getting a little old I only filled it up to about the 2.5 gallon level when I needed to. What I do is to fill it up and then put it on to my pickup’s tailgate, drive around and then put it on my back when I am in location. As its on the tailgate I can simply back into it, put the shoulder straps on, and off I go. I was impressed with how strong the shoulder straps are, and found the padding to be of great use. The waist strap was also both strong and effective. I found it to be a great product with no signs of leaking at all. Overall, this is a fantastically well-built and smartly designed product. This is important when you are dealing with toxic and abrasive chemicals and clearly the company takes this very seriously. Overall, it comes fully recommended for anyone that is looking for a way to deliver weed killer over large areas. Buy the alternative Sprayer Back Pack Battery Operated 16L Litre Pump Garden Weed Killer Knapsack product on Amazon.co.uk using this link.